A new variety of kiwifruit suited to the subtropics with a very low chill time. The Kiwifruit Sweetie - Female should be available in march 2007 so if you are interested you can select "Email me When Available" on the Kiwifruit page. Here is a video of our trial in the Daleys Fruit Tree Orchard. We are now listing our fruit trees according to popularity using the past 3-6 years of data. The top Australia Plants currently are the Lime - Tahitian, Dwarf Mulberry, Fig Black Genoa and the Lemon Eureka. I have been wondering why the Tahitian Lime would be so popular among Australians and I think I might have found one of the reasons in Woolworths this week. Limes were selling for $24.95 a kg which was even more expensive then Dragon fruit at $15.95 a kg. So I guess many of you have thought that by purchasing one lime tree it won't take long before you have recouped the initial outlay of $19.90 for a Tahitian Lime. Tip: For those of you eating your Dragon fruit this time of year many people recommend a few drops of lime to give them an even better taste. Australia Plants - Most Popular - To view Plants for Australia, Your State or even the most popular fruit trees in your local suburb. You now can now find out what plants are popular in different areas throughout Australia. With the release of an organic control method for fruit fly, I have been waiting for Spring to run a trial in our orchard. Early results are very promising with fruit fly counts in the Wild May traps reducing significantly each week. We have been using Naturalure each week sprayed as a bait randomly on lower leaves of some of the orchard trees. A control at Kath's orchard using only Wild May has shown an increased count of fruit fly each week in the traps. The real test will be when the early stone fruit ripen next month. Will keep you informed. 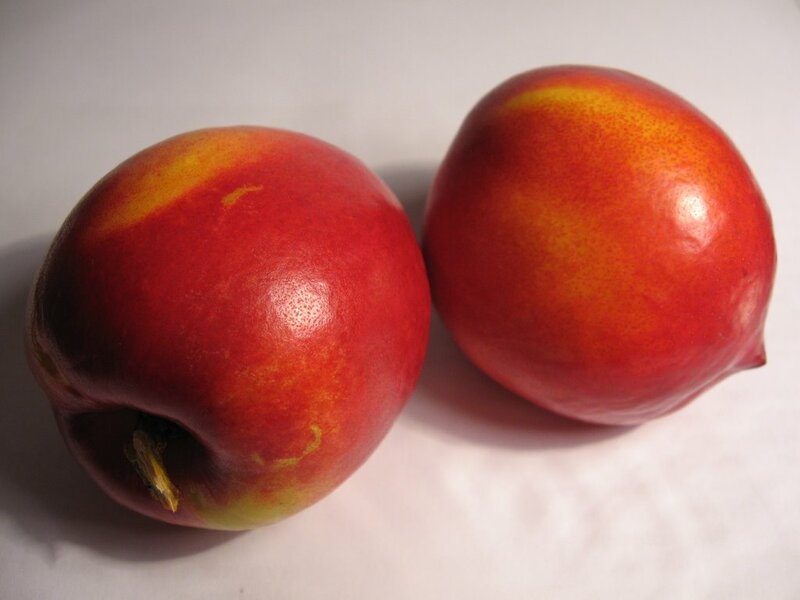 It is the start of the fruit fly season and this year I am determined to pick some tree ripened maggot free nectarines. I have a fruit fly trap in my nectarine with the organic fruit fly attractant called Wild May in it; this traps the male flies and is an indication of how active the flies are. I have been trapping flies for the past few weeks. Now that my flowers are forming fruits I have been bagging the fruits with fruit fly exclusion bags, these are made from waxed paper and are available in different sizes for different fruits. See Green Harvest web page http://www.greenharvest.com.au/ for more information. 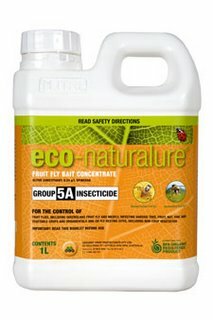 It is also the time to begin spraying the other organic product eco-naturalure this attracts and kills both the male and female flies. All I have to hope for now is that the birds realize that the big fat juicy ripe nectarines are for me and not them. 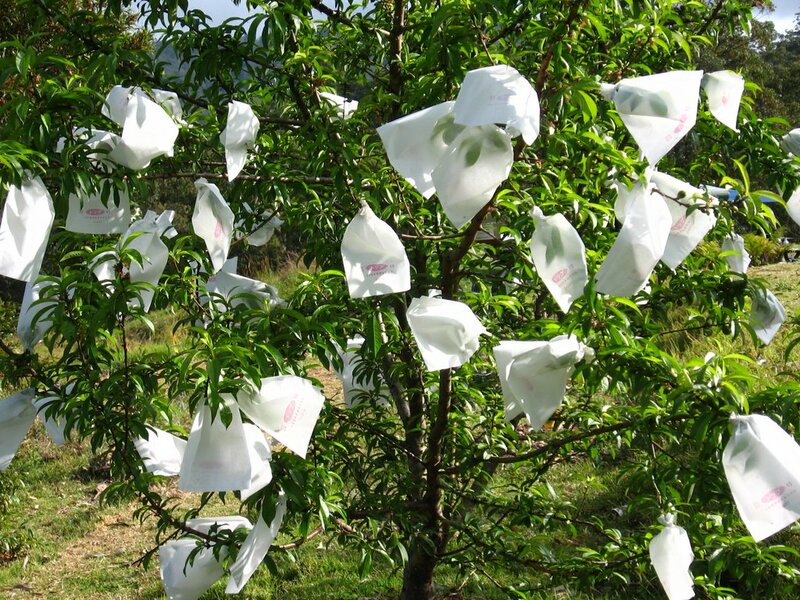 Kath shows how you can grow your fruit trees in bags. Delivering live plants to your doorstep in great condition is something we are continually improving here at daleys nursery. In this video Kath demonstrates how your plants are prepared for the courier. 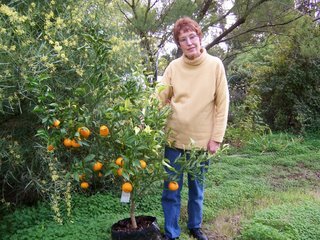 Julie Woodman who is 40 minutes from Perth has been having great success growing fruit trees in bonsai bags. 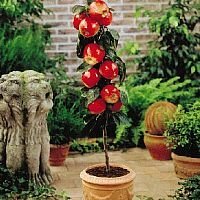 The idea is that if the roots are restricted your fruit tree stays small and produces more fruit. - Use a good potting mix with some fine bark and humus. Here is a photo of my flame tree that was taken on the 8th July 2006. It is in full bud and is going to be a stunning show of flowers in a matter of weeks. This seems a little early to me but my flame tree has never been normal. It is the first tree that I ever grafted and is a flame tree Brachychiton aceriflolius grafted onto a bottle tree Brachychiton ruprestris, this is the third time that it has flowered in twelve months. 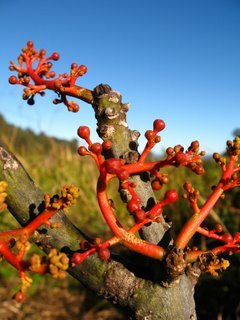 Is there anyone out there with a passion for brachychitons who knows what effect the bottle tree rootstock will have on my flame tree? I spoke with a lady in Mullumbimby yesterday who has a bowen mango in full flower so maybe it is the season for unseasonable flowerings. 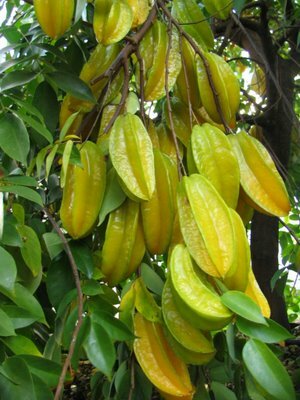 Juicy Carambolas have been fruiting prolifically this time of year. They have a place in subtropical backyards fruiting twice a year in Summer then again in winter. The abundant crops can be made into fresh juices. Add some ginger for a very delicous fresh juice. Due to Frosts in the Riverland and Murray Valley regions the orange price are set to increase. 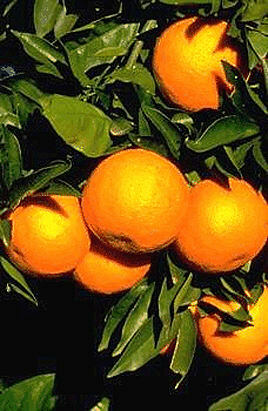 The navel oranges have been effected and the Valencia oranges may also be effected. There has never been a better time to have an orange tree in your backyard so you can enjoy oranges fresh rather then paying these big prices from shops. 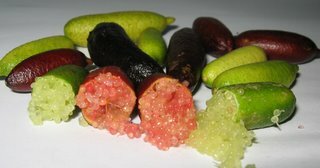 We are starting to harvest some of our finger lime varieties here at the nursery and if left on the tree until they fall off at a touch they are delicious. The cutting grown yellow fruited variety is a prolific producer that crops over several months, it's fruits are small to medium in size. The Wauchope is the maroon/black lime which seems to vary immensly in colour from deep dark reds through to black. The limes balls inside also vary in colour from almost clear with a pinkish blush to pinkish red. They are great squeezed onto a salad. Shahtoot is a new multi-purpose tree for Australia. It is a popular hybrid species in Pakistan and the Middle East because it is an attractive fruiting tree which is easy to grow and maintain. The large non-staining fruit is very sweet and nutritious. At around 30% sugar when fully ripe, Shahtoot is much sweeter than the English black mulberry. Being white and essentially seedless avoids the messy staining associated with other mulberries. 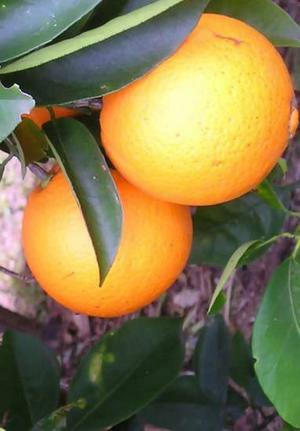 Fruiting occurs from October through to December, and commences the first season from planting. Shahtoot is a vigorous growing deciduous tree to 10 m. It forms a dense crown with pendulous branches and makes an attractive spreading shade tree, especially when 'pinched out' to the desired shape. The leaves are semi-lobed and vary from lime green on the new flush to dark green when mature. 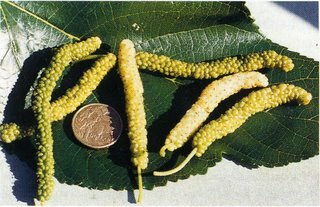 It is the branching nature of Shahtoot to grow 'out' rather then 'up' which sets it apart from other mulberries as an excellent garden specimen tree. Shahtoot is renowned for its hardiness. It withstands extremes of heat and cold, allowing it to thrive in Australia from the arid interior and tropical north through to the cold temperate south of the continent. In Pakistan it is cultivated to 3050 m ( 10, 000 feet). 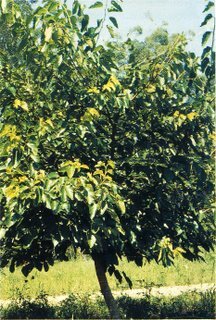 Shahtoot is grafted onto vigorous seedling rootstock, making it a deep rooted tree which grows rapidly given adequate moisture and nutrients (3.5m in 12 months). However Shahtoot will also survive drought conditions making it an excellent shade tree for sheep and cattle-yards where it can be topped for fodder. In foul yards, chickens thrive on fallen fruit and benefit from the summer shade and winter sun that Shahtoot, being deciduous, provides. Shahtoot has excellent fire retardant capabilities. 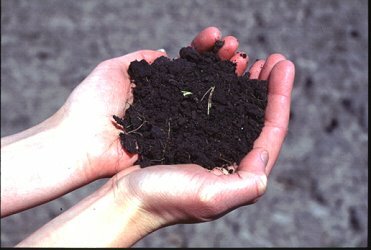 Most soils are suitable for Shahtoot including heavy clay types. This adaptability makes Shahtoot excellent as a street tree and suited to all sunny garden situations as well as 'problem' landscaping sites like hot courtyards or concreted car-parks. Shahtoot is easy to establish and maintain. No sprays are needed since there are no known pests or diseases which attack the leaves or fruit, other than fruit eating birds. Shahtoot responds to applied water and nutrients with rapid growth yet survives minimum care conditions equally well. To obtain maximum branching on young trees it is preferable to 'pinch out' the terminal growth tips between thumb and forefinger when branches reach 1/2 to 1m length. Shahtoot can be pruned during winter dormancy with each lateral cut by approximately half. This also facilitates branches and maintains Shahtoot to a manageable size. Fruit: Shahtoot fruit can be eaten at half green stage when they are crisp and semi-sweet, or left until fully ripe when they turn white in colour and obtain maximum sweetness. Fruit falls to the ground at the white stage, which is assisted by shaking the tree. Shahtoot fruit is excellent eaten fresh, its sweetness provides an ideal contrast to other foods in salads and sambals or on a cheeseplatter. Shahtoot makes a novel garnish to many dishes. In Pakistan Shahtoot is often dried and used as a source of sugar. Tree - Other Uses: Shahtoot leaves are unparalleled for rearing silkworms. Shahtoot wood is hard, suitable for tuning and carving, especially for hockey sticks, cricket bats and stumps. Citrus loves hot sunny spots with shelter from strong winds. Good drainage is a must with sandy loam soil and a neutral PH. Give a 3-4 meter break between trees. You can plant citrus all year round simply by digging a whole 3 times bigger then the pot, add some organic matter or manure and 200g of some blood and bone should be layered in the bottom of the hole. 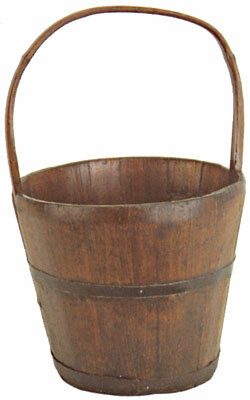 When filling in the soil halfway is a good time to add a bucket of water. Then of course mulch heavily with some initial fertilizer which should last for the first few months. The first few years are the best time to develop a great root system. So it is best to get rid of the fruit. Citrus love nitrogen. In Australia we are coming up to late winter and early spring so remember to give a fast acting fertilizer with a bucket of water. The first few months your new citrus tree needs water until it is established so remember to give it a good soaking twice a week. After this when it is very hot your plants will appreciate more water. Citrus pruning can be limited to skirting which is where you prune the lower branches back to 30-40cm. Prune the rootstock suckers, deadwood and the long water shoots. As the clock strikes 12 tonight (13 June 2006) Brisbane residents will have level 3 water restrictions. Despite heavy downpours even 2 days ago this rain just doesn't seem to fall in Wivenhoe or the Somerset dams catchment areas. "Level 3 means roll up your hoses and bring out the buckets for Brisbanites"
Excessive rainfall or over-watering will stimulate weak sappy growth at the expense of fruit. To optimise fruit yield you need to water the right amount at the right times. Mulch, Mulch, Mulch: Makes sense doesn't it. A nice mound covered by mulch will keep water in and provide nutrients. Maintenance Schedules: Certain times of the year fruit trees need very little water other times more. 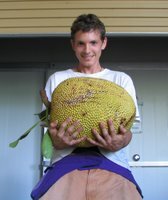 Some fruit like Jakfruit require large amounts of water where as others such as a figs require less. A bit of time researching your fruit trees will help you apply the right amount of water to ensure that great yield even with water restrictions. Try doing a search on google eg "Watering Avocado Trees". Here is an example of an Avocado maintenance Schedule. I have one of these cactus in the backyard and I know why it continues to be so popular. Dragon fruit tastes great (especially with a few drops of lime) and seems to grown anywhere in my area just give it a wall or a tree to grow up. By cutting off a section and re-planting them within a short time you have another dragon fruit to go climbing with. I am always surprised how many requests for this herb plant we get. There must be a lot of curry lovers out there. Unfortunately they are slow growing when young but we are doing our best to get them ready because we know how much you all want them. It won't be long before they are ready for sale. The Sheppard variety is our most requested Avocado variety. I am assuming because of its high yield and great frost resistance. One of John Piconi's Jakfruits recently picked ready to be sold at the Byron Bay Farmers Markets. 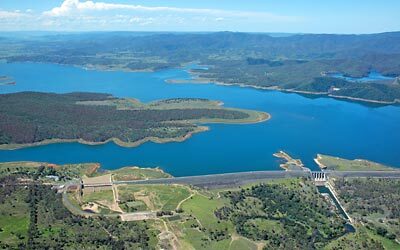 John is experimenting with a range of selections that will perform in northern NSW. Recently we grafted a pink fleshed selection with very large arils for John, hopefully it will be a winner for him. Besides selling his Jakfruits as a fresh fruit he also has been drying the arils with the seeds removed, absolutely delicous. If you ever have the opportunity to be in Byron Bay on a Thursday morning visit his stall at the Byron Bay Organic Farmers Market. Recently Les Jefferson from Harvey Bay hybridised a Passiflora quadrangularis with a Passiflora alata. He used pollen from the Granadilla to get his P. alata to set fruit, which was self infertile. He sent me seed of the resulting cross which I grew on and the picture is the resulting fruit. 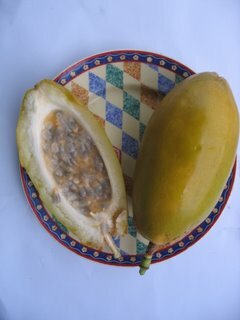 Smaller in size than the Giant Granadilla but with a very nice sweet flavour similar to the P. alata. Has anyone else tried to hybridise other passionfruit? Growing between 1 to 2 meters with fragrant white flowers in Summer. Then between June and August plenty of bright red berries each containing 2 coffee beans are ready for picking. With a bit of sunlight you can grow coffee indoors they are extremely ornamental. 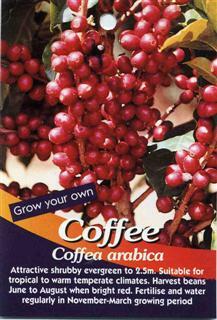 Have you grown coffee plants? Australia is rich in spectacular fruit trees and home to an excellent range of Rainforest plants. We hope to use this blog as a place where we can share and learn together. For the weekend fruit growers we hope you enjoy the many topics this blog will cover. Please feel free to add your comments. If you would like to contribute articles to this blog please contact us. We want to hear what you have to say about these articles so please feel free to add a comment. Perhaps the information helped you or you would like to suggest a topic for a future article. When visiting our nursery a lot of our customers love reading the plant tags attached to each new plant with information such as planting position, climate details and fruit yield. Now you can view all these tags from our website in alphabetical order.